Narsingh Yadav had maintained that the failed test was the result of a conspiracy by his opponents to stop him from participating in the Olympics. The National Anti-Doping Association (NADA) on Monday gave clean chit to wrestler Narsingh Yadav in doping case and allowed him to participate in the Rio Olympics. A panel of the NADA, reviewing Narsingh’s case, said the wrestler is a victim of sabotage as there is no fault and negligence on his part. 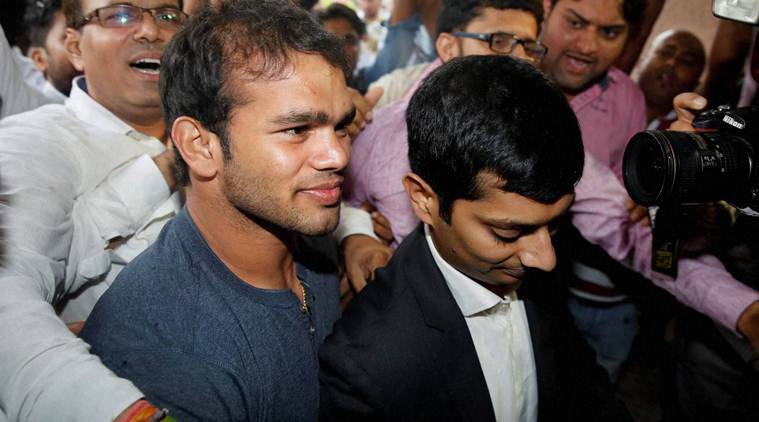 “There is no fault and negligence on Narsingh Yadav’s part, he is a victim of sabotage done by a competitor,” said NADA DG Naveen Agarwal while reading out the verdict. “We kept in mind that in the past, till June 2, none of his samples were positive. It was inconceivable that one-time ingestion would be of benefit. Therefore the panel is of the view that the one-time ingestion was not intentional,” said Agarwal. The panel concluded by saying that the wrestler deserves the benefit of article 10.4 of NADA’s anti-doping code. The 74kg freestyle wrestler was earlier tested positive for a banned steroid in an out-of-competition test conducted by NADA. However, the 26-year-old had maintained that the failed test was the result of a conspiracy by his opponents to stop him from participating in the Olympics. Yadav, was replaced by Parveen Rana in the Olympic bound squad but now after NADA’s verdict he will be reinstated. Narsingh was present at the NADA headquarters in New Delhi when the decision was taken. He had been picked by the WFI ahead of Sushil Kumar for the Rio Games on the basis of him bagging the 74kg Olympic quota berth with a World Championships bronze in 2015. After NADA’s verdict, IOA vice-president Tarlochan Singh said that there will be no procedural hurdle for Narsingh as he gears upto participate in the Olympics. “It’s a healthy sign for Indian sports. He (Narsingh) was unnecessarily being made a victim by certain interested person. We are very happy that NADA has taken a proper decision at the right moment. He can very easily reach Rio and join the Indian team. NADA has taken time but has taken proper decision,” Tarlochan told Times Now. Tarlochan clarified that since it was not a WADA test or ban by world wrestling body, Narsingh should not face any further hurdles. “He has not been penalised by WADA codre or World Federation. It was a decision taken by a local body which has been done properly again after proper investigations so that it goes in his favour,” said Tarlochan. Though, Narsingh Yadav will have to go through a reinstatement test before he boards the flight to Rio, if he is cleared by WADA / IOC.